Your stock pot is one of the most versatile pots in your kitchen. There will be many occasions in which you will use one including soups, stews, curries, pasta. You can also use your stock pot to stream, roast and fry. ​ Finding the best stock pot for your kitchen is important, probably more than you realize. While many people can survive on a basic saucepan and a frying pan, it really won’t suffice for a more elaborate recipe. For one, it's hard to cook pasta, especially stock in either of those two pans. 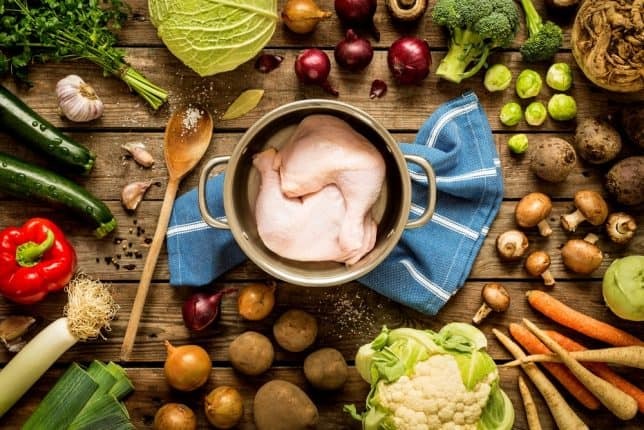 Having a good stock pot can save you a lot of money from having to buy more than one, and mind you, there are so many types stock in various shapes and sizes which can make your head spin just thinking about it. All you have to do is find out what you need the most and choose accordingly. So, What Do You Need A Stock Pot For? A stock pot is intended for cooking and making stock. A stoc﻿﻿k is a base ingredient in soups and sauces. While a broth will mean there are no meat bones used, a stock would typically include the bones. To produce a good stock, you need to be able to quickly bring both the meat and bones to a boil then allow it to simmer for a long time. A stock pot is often used for preparing dishes that require an extended period of boiling and simmering, but it also perfect for a quick boiling of pasta noodles and corn. 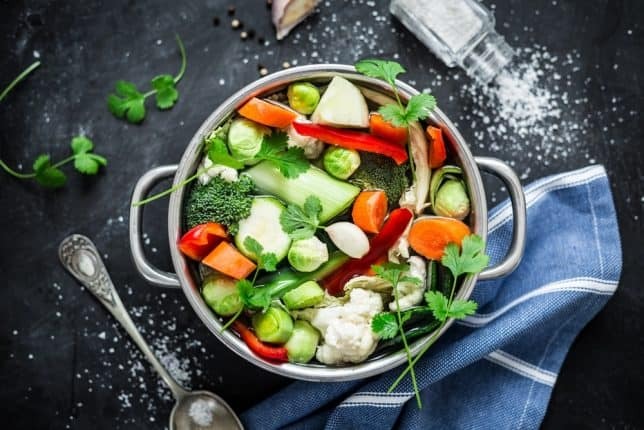 When it comes to finding the best stockpot, there are several things you should take into consideration to ensure that you get the one that would more than suit your needs. 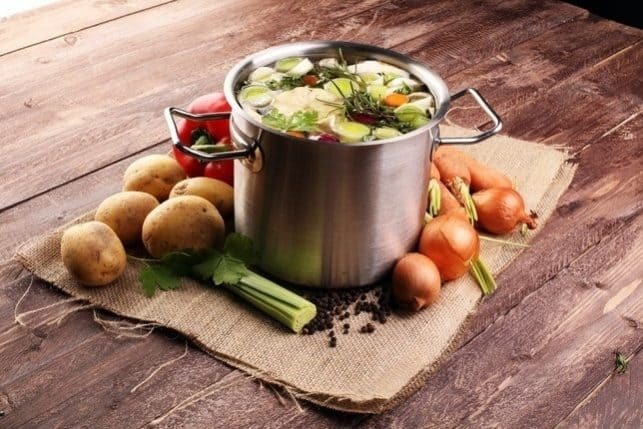 Since making stock needs long cooking over low heat, you want a pot that’ll be large enough to make massive batches of stock while being durable enough at the same time to handle an extended cooking session. What is a Good Size Stock Pot? Stock pots are usually available in sizes between a small 6-quart to a large 20-quart. 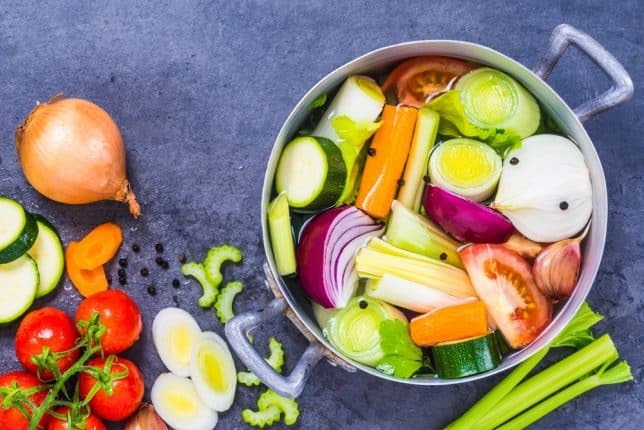 When it comes to cooking soup and stock, you would usually need to make more stock compared to soup, which means that your stock pot ought to be bigger than your soup pot. Though it doesn't automatically mean that you need two different pots, you can just get a stock pot that won't be too small for making your stock, but won't be too big to make your soup. The best stock pot size for most families would range between 6-12 quarts so you may want to check stock pots in these sizes before you decide on anything. What’s The Shape You Should Look For? A stock pot typically features a round base, deep straight sides, and a cover. Though this shape is more vital when making stocks and stock reductions, it works well for making soups too. Is it possible to use a shorter, smaller, wider pan for soups? Definitely! But depending on how much you're making, you might want to use an oversized saucepan instead. However, your soup will fare well in a stock pot, so now you have two good reasons for getting a stock pot! Regardless of what kind of pot you purchase, or any cooking container for that matter, having a thick and sturdy bottom will stop your food from burning. I got a free pot one time when I purchased a small induction stove and the bottom flared in less than five minutes! Not fire per se, but it started turning red in the center. Definitely bad! Stock requires time to cook, and the pot is going to be sitting on the stove top for long periods. You don’t wish the ingredients to scorch and perish just because your stock pot is made from cheap materials. Imagine the mess, not to mention how bad the burn will be if a pot gives out on you in the middle of cooking! What’s The Make Of The Stock Pot? The material with which your stock pot is made from is also very important. There are several choices to choose from like copper, aluminum, cast iron, stainless, and a large variety of other combination of materials which all have their own pros and cons, depending on your preferences and needs. Aluminum for one is a great conductor of hear. It is cheaper than stainless steel and is much lighter in terms of weight. However, stainless steel is more durable and is also non-reactive to acids making it a lot safer and more efficient to use if you want something for the long haul. Aluminum can leak toxic chemicals into your food which you don't want for your family. Manufacturers have discovered the beauty of encapsulating aluminum metal within layers of stainless steel to get the benefit of both materials. Is The Handle Good Enough? 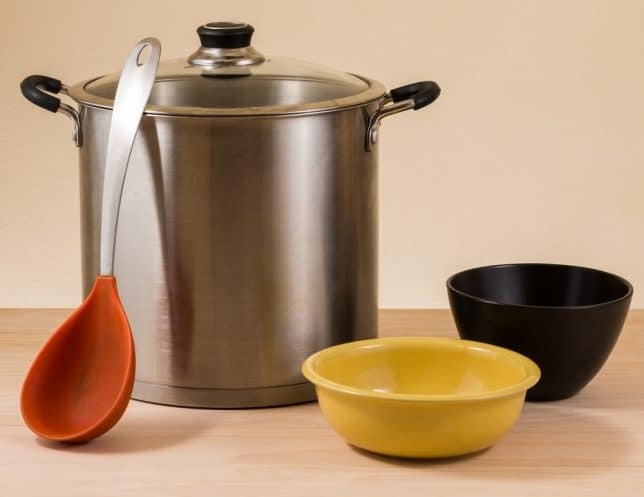 Whether you're going to use your stock pot to make stock or just to boil some corn, you need a well-shaped pot with a handle that you feel assured won’t fall off when lifting a full pot of hot liquid. You want handles that are securely attached to the pot with sturdy screws. Even if the product claims to have a stay cool handle, it should still be big enough for you to grab with kitchen mitts which can make moving it from the stove to the sink without any trouble. This stock pot is made of very fine materials which can perform all of your stock and soup making needs. It is designed to last a lifetime, Cuisinart cookware makes family meals memorable and entertaining a pleasure. It has an encapsulated aluminum pot bottom eliminates hotspots and ensures even heating. It also has stainless-steel handles that stay cool on the stovetop and are bolted to make sure it won't give out when transferring a hot pot. It has a tight-fitting stainless lid. It is over safe, dishwasher safe and has a lifetime warranty! Lid cover is solid steel which makes it impossible to see your cooking without lifting the lid. This is stockpot is great for cooking for small families with its 12-quart capacity. 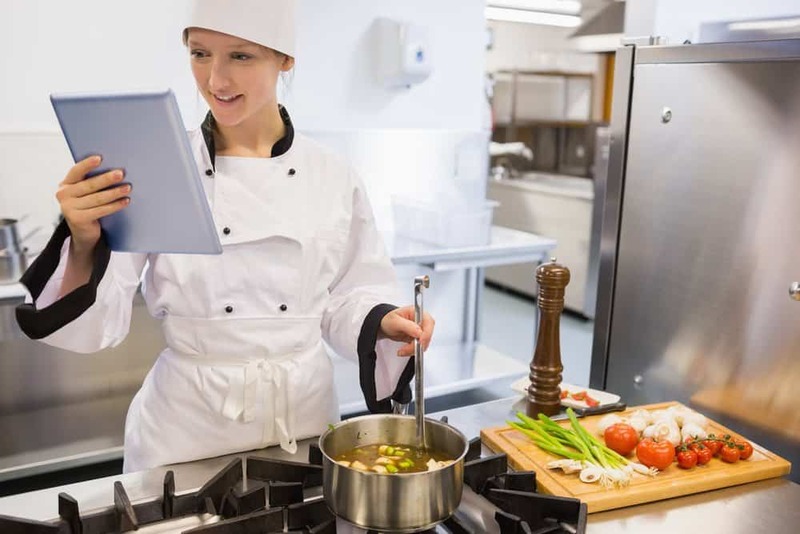 Both interior and exterior are non-stick which makes it very easy to clean, but also healthier foods since you will be able to use less oil and fat to make your foods. The glass lid allows you to watch your cooking progress while the vented hole lets steam escape preventing boiling over. This 16-quart stainless steel stockpot comes with an encapsulated aluminum base to enhance faster and even heat distribution. It has a tempered glass lid with a ventilation hole which will allow you to monitor your cooking without having to lift the lid yet allow a bit of the steam out to prevent boiling over. This Cook N Home Canning pot and Stockpot is made of stainless steel with a tempered glass lid to let you see your cooking progress without lifting the lid. The handles are built for strength and durability. It has an amazing 20-quart capacity which is great for cooking for small dinner parties! It also an encapsulated aluminum bottom to make sure your food is cooked evenly. Farberware Classic Stainless Steel 16-Quart Covered Stockpot features a thick aluminum core surrounded by stainless steel making heat distribution more uniform and faster. It has a very attraction polished to a mirror finish. You can use it in the oven for up to 350F and has strong handles to sustain being moved about. You may even put in the dishwasher afterward to help out with the cleaning! Lid won't allow you to check your cooking without lifting the lid. Which Stockpot Should You Be Getting? Cuisinart 77-412 Chef's Classic Stainless is our top pick for this review. Not only do we find the size ideal, but it also comes up to par with the qualities and standard of what we consider a good stock pot. It also comes with very useful accessories that will come in handy for a bunch of your cooking needs. I’ve had this pot for two years and I am still not having any issues with either the quality or the durability of this product. Are you worried about sauce burning? You may want to find good cookware to make sauce. Spend some time to read the article about best copper cookware. Using it is quite easy as all you need to do is to set the temperature. If you liked this review or if you have anything you would like to share with us, please post your comments below. Thank you for reading!